Adapteva today announced delivery of the first Parallella computers ordered through its highly successful Kickstarter campaign. 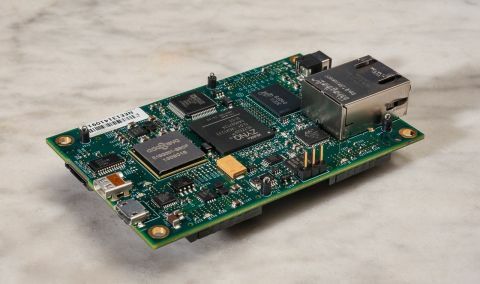 The Parallella, equipped with Adapteva’s breakthrough 16- and 64-core Epiphany multicore processors, is a platform with unprecedented performance and flexibility which brings parallel computing to a new generation of programmers in a low-cost, credit card-sized package. Adapteva's Parallella Board - Dimensions 3.4" x 2.1"
Adapteva, Inc. is a privately-held semiconductor technology company based in Lexington, Massachusetts. Adapteva has developed the world’s most energy efficient multicore microprocessor architecture, immediately boosting by an order of magnitude the number of cores that can be integrated on a single chip. Adapteva’s breakthrough architecture will have an immediate impact on a wide range of end-user products, from compact mobile devices to next generation supercomputers. The first semiconductor company to successfully fund a project of Kickstarter, Adapteva’s Parallella platform will bring parallel computing capabilities to a new population of programmers. For more information on the company visit: http://www.adapteva.com or the Parallella Forum at http://forums.parallella.org/index.php.